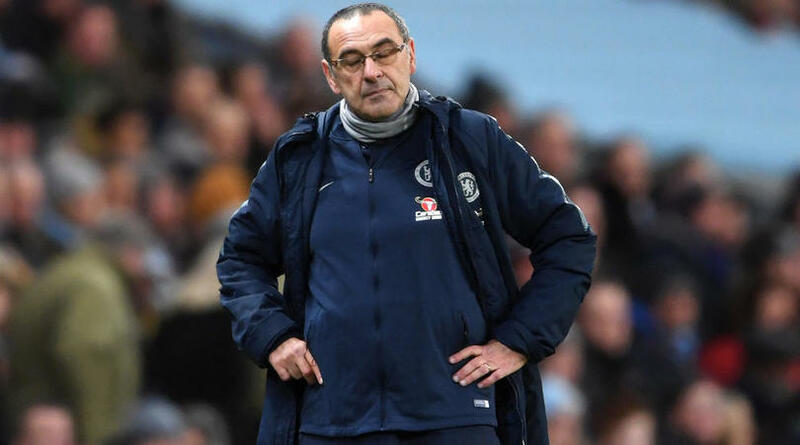 Maurizio Sarri insisted his job was ‘always at risk’ after a humiliating loss to Manchester City put further pressure on the Chelsea head coach. Chelsea suffered their third defeat in four league games, a 6-0 thrashing at the Etihad Stadium marking the club’s biggest-ever Premier League loss. Sergio Aguero bagged himself a record-equalling hat-trick, while Raheem Sterling scored a brace, and Ilkay Gundogan got the other to compound the Blues’ devastating defeat. The result had such an impact that Sarri’s side have fallen to sixth in the table to sit a point behind the resurgent and fourth-placed Manchester United, and now face an uphill battle to finish in the Champions League positions. ‘You have to ask the club. I am worried about my team,’ Sarri told a news conference.